Watching TV the other night, inspiration hit me. I decided it might be worth trying to capture this man using a still of his face, which I found quickly, thanks to the magic of Google images. This was the result, with 2B graphite pencil in my Strathmore Mixed Media journal. I hope you enjoy! To everyone affected by the snowstorm, I think after digging out, it’s time for paint, pencils, and splashes of happiness? Everybody, let’s dance. Peace and Happy Sunday to you. Wow so striking. Is this a young Jerry Seinfeld? Thanks, Kathy! Glad you enjoyed it! Care to take a guess? Now I know who this is, he is one of my favorites. Fabulous Laura. I hope all is well concerning snow in your neck of the woods. You are getting so good with your faces. This one is so good. Way to go! Stay warm and keep that pencil moving! Thanks so much, Carmel! So you recognize him then? I love when this happens! We’re well on our way to digging out! Lol Charlie, thank you!!! So glad you saw him and enjoyed it!! Aww thanks, Snehal! I’m trying to get better, anyway. Onward and upward. I was happy with this one. Faces are fun when you get a likeness. Or even come reasonably close. Thanks, glad you enjoyed!! Thanks so much, Rebecca! I’m so glad you enjoyed it! I’m having so much fun with these faces! Thanks for your kind comment! What a wonderful face! It looks like a very familiar face of a funny man named Jerry! Wonderful portrait sketch Laura – real nice work here! You are really good at portraits Laura – shading and form are beautiful. Thanks so much Kerfe! I hope you and NYC are well. Have you seen The Art Prescription blog today?? I thought of you immediately. It’s a mess here, will be for awhile I think. Too much all at once! No doubt. I’m so glad the sun will be out again today! Wonderful job on this face! Thanks, Teri! So glad you enjoyed it! Yay, awesome Jill! I’m so glad! Really enjoyed drawing him. Love his show! wow, I can see you growing with every sketch. this motivates me, thank you! Thank you, Arvind! What a kind thing to say, and I’m so glad to be able to motivate you! Looking forward to your next post! Laura, very very Impressive drawing! You have progressed in a huge quantum leap, its amazing to see 🙂 do you ever look at your drawings from last year, and then look at your current work? Eye Opener!! I must admit I had no idea who it was, but it’s a very handsome portrait! Great work, Laura! Thanks, Jacob! I’m so glad you like it! I really should focus more on worldwide figures, but sometimes inspiration strikes when we least expect it. Oh indeed! Draw whoever (and whenever!) takes your fancy! I’ve been a huge fan of his for so long and never tried drawing him. So glad you recognized him & enjoyed it, Teresa! Thanks! Thanks so much, Eileen! I appreciate it! I use Google a lot. Wonderful likeness! With me sometimes it depends on the day, my energy level and time of day I do it. I agree. Sometimes if I stay up really late and have almost no energy…..it works out better. I’ve never figured that out. Jodi is very good at guessing these portraits! very nicely done, Laura. I watched some old and new Seinfeld stuff online yesterday after working on my wordpress site. Thank you for finding it and liking it! And best wishes for a juicy and creative 2016! You’re an inspiration! Thanks so much, AJ! Gotta love him! Hi Laura: Evidently I was busy at the end of January and missed quite a few emails, including the one for this blog post. 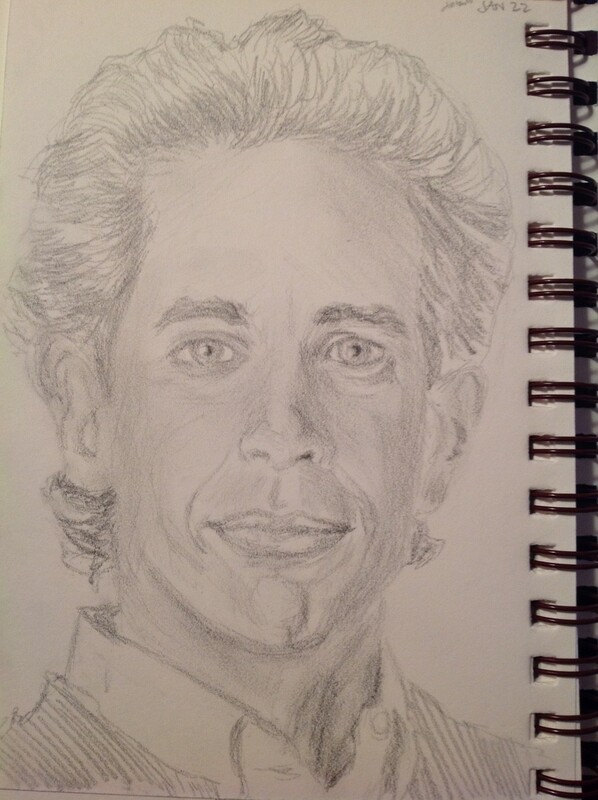 Great job – I am so impressed with your talent in drawing portraits! Thanks, Carol! I seem to just love faces. I think I’ve finally found what I’m supposed to do in art with this challenge. I can’t get enough of them! Back in high school, faces were something I always wanted to do, but I was really terrible at drawing them. Maybe it’s meno lol? I don’t know, but suddenly I can do it and I really enjoy it. No clue how it happened (I think it comes straight from God, honestly, because I know it’s not me). Have a wonderful weekend ahead and I’m really glad you enjoyed this portrait! More to come tomorrow – he will be harder to guess though (I think). Awesome likeness, very talented soul you are Laura. Thanks so much, Kath. I was watching the show while drawing! Love that show!